After the release of their first 7-inch, ‘Maastunnel/Mt. Mitake’, Will and Rutger decided to make it a series, and continue with another. ‘Numa/Penarie’ is the second collaboration, containing all-original audio pieced together from snippets of much longer source material. The artwork is a collage of old postcards from Jimbocho in Tokyo, and the single is again accompanied with two beautiful videos by Marco Douma. 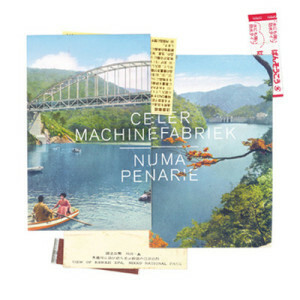 This is part two of a three part series that sees Celer lad (Will Long) collaborate with Machinefabriek lad (Rutger Zuydervelt) – something that a lot of people seem to keen on hearing. I believe this is also part of a video project with collaborator Marco Douma making vids for each piece. Haven’t seen the vids so some context may be lost but as a stand alone 7”, it’s pretty decent. It’s on the usual ambient tip with subtlety being the order of the day. Haunting synths drift aimlessly on ‘Numa’ before focusing themselves with an abrupt thump and petering out in a digital frenzy to be replaced by the initial flow of ambient choral synth tones. Flip it and ‘Penarie’ picks up where ‘Numa’ left off – you know, ambiently. This side really reminds me Eno’s early ambient forays and again makes great use of choral synthesis to envelope the listening in warm and inviting tone. Very CHILL. Very ASTRAL. You know the score. Ltd. to not very many and won’t be around long enough for you to ponder it so you might as well order now. Thank you drive thru. Clearly satisfied by the outcome of their first seven-inch release, Maastunnel / Mt. Mitake, Will Long and Rutger Zuydervelt return for another installment, this one similar in concept and titled Numa / Penarie. Put together in Tokyo and Rotterdam earlier this year, the two tracks contain original sound elements stitched together from longer source material, and the release is enhanced by its postcard collage presentation and two complementary videos created by Marco Douma. The tracks themselves are a contrasting pair, the first “Numa” very much in the Celer tradition in fashioning a mood of becalmed iridescence, even if some measure of turbulence briefly intervenes halfway through its five-minute run. “Penarie” immediately distances itself from the other in opening with horn-like synth flurries, though it, too, gravitates repeatedly in the direction of soothing splendour. In both pieces, one often witnesses an ongoing oscillation between the ambient stylings of Celer and the rougher textural play of Machinefabriek. Needless to say, that’s a good thing, as the collaborators’ respective tendencies render the material less homogenous and predictable than it otherwise might be. Numa/Penarie are more obscure experiences. Numa is almost like a collection of sounds experienced throughout the day; clusters of lights buzzing, bell-like sounds, subways braking, jets taking off in the distance. The second section is more intense (again, a feeling of being underground), expansive and layered with lower frequencies underneath. The close brings a return of lighter and higher frequencies, returning somewhat to the opening themes. Penarie is perplexing; it’s dense, electric and unrestrained. It expands and contracts with clusters of tones. Then there is a pleasant interlude of Mellotron-like waves before mixing with the original themes and sounds, while being accompanied by a clock and then fading quickly, almost like a fleeting dream.